A traditional element to any mehndi or wedding is a fruit display. Made out of fresh fruits of your choice whether it be apples, bananas, red or green grapes, mangoes or pineapples. They are very colorful and vibrant so will stand out at your venue hall. We have made various shape fruit displays from palm trees to swan shape displays. 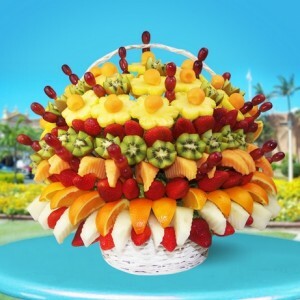 The displays take many hours to produce so why not leave it to our expert fruit display artists and we will deliver it to you at the location of your choice. They are of course all edible!